Our family moved to Kuala Lumpur at the end of 2001 so our daughters started school mid-year at the International School of Kuala Lumpur in early January. This was right after September 11 and the school decided that it would be a good idea to make sure that everyone on campus - students, teachers, administrators and parents alike - had photo identification cards. And, while they were at it, a new system was put in place where parents could add monetary value to the cards and elementary students could use them to buy lunch and snacks in the canteen. Within the first few days, we had met Madam Wong. 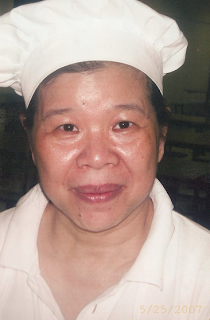 A diminutive Malaysian Chinese woman, Madam Wong was the ultimate lunch lady, kind-hearted to a fault and a very good cook and baker. She managed to keep track of which child belonged to which mother, who wasn’t eating their lunch and who was buying all his or her friends snacks on the ID card after school. She was not beyond chiding a child into choosing a healthier option. When a student’s credit balance got low, parents were sent an email asking them to top it up. If there was a delay and the child ran out completely, Madam Wong would still feed him or her, keeping a separate ledger of debts. Technically this was against the rules but she just couldn’t bear to see a child go hungry. Madam Wong was also the official caterer for Girl Scout events, giving us leaders a price that I am sure left little margin for profit. She never failed to have a kind word and a cold Diet Coke for us, even when soft drinks were banned on campus. Needless to say, we adored her for that. And she provided the snacks for the monthly PTA meetings. She made a great selection of sweet and savory items but my favorite were her pizza rolls. Soft yeast dough, rolled out flat and covered in delicious garlicky tomato sauce and cheese and then rolled up, cinnamon roll style, sliced and baked to tender perfection. 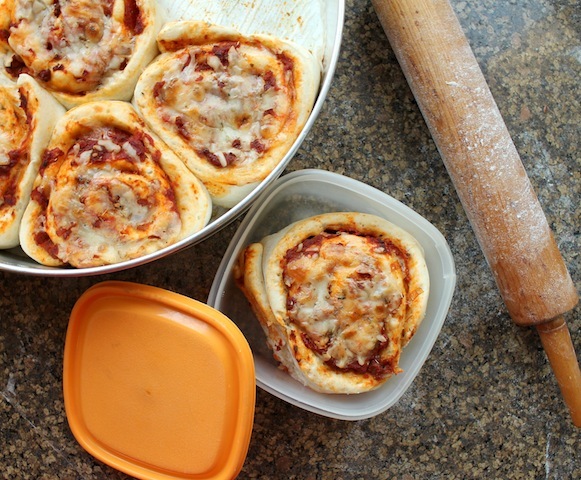 When I read that our Sunday Supper theme this week was lunchbox ideas, Madam Wong and her pizza rolls sprang to mind. Why not make a larger version of her rolls, perhaps with added pepperoni? These make the perfect, portable take-along lunch. In fact, I wrapped them up and we ate them on the road, in the car, as we zipped along the highway to Abu Dhabi on Saturday. Divine. 1 packet dried yeast (1/4 oz or 21g) – I used Fleischmann’s Rapid Rise. 1 1/2 cups or 400g pizza sauce - I used homemade but feel free to use your favorite jarred sauce, if that makes your life easier. Pile the flour in a very large mixing bowl and make a well in the center of it. Pour half the water into the well, then add your yeast, sugar and salt and stir them in with a fork, grabbing just a bit of flour from around the well and mixing it in. Continue to bring the flour into the center until you get a very thick batter then add the remaining water. Continue to mix until it's quick thick again, then you can start using your hands, gathering up all the flour and working it into the dough. Flour your hands and pat and push the dough together with all the remaining flour. On a clean surface, knead the dough for four or five minutes, turning it and folding it over and slapping it around until you have a lovely elastic dough. Flour the top of your dough. Put it back in the bowl, cover with plastic wrap, and allow it to proof in a warm, moist, draught-free place until doubled in size, about half an hour. I put mine outside, in the shade but with our hot Dubai temperature, it rose like crazy, which is always my favorite part of making bread. It’s fun to see science in action. After the rising - it grew and grew and grew! Line your baking pan with a little non-stick spray or oil and a bit of parchment paper cut to roughly the size of the bottom of the pan. If you have a non-stick pan, you might skip this step. When the dough has risen sufficiently, punch it down and roll it out into a large rectangle (about 17x13in or 44x33cm) using a light sprinkling of flour to keep it from sticking to your counter top and the rolling pin. Spread it liberally, right to the edges, with about two-thirds of your pizza sauce. Slice the fresh mozzarella thinly and scatter the pieces on the sauce. Place bits of pepperoni between the mozzarella, if using. Use a serrated bread knife to slice the tube into rolls and place in your prepared pan. Leave a little space between them so they have room for the next rising. Top each roll with the remainder of the sauce and then sprinkle on the grated mozzarella. Top each with a tiny pinch of dried oregano, if desired. Cover the pan with cling film again and allow to rise for another 30 minutes. Halfway through the rising time, preheat the oven to 350°F or 180°C. Bake in your preheated oven at oven for 20 minutes, until golden and scrumptious-looking. Eat straight out of the oven. Or package up for lunch on the go. Blueberry Egg Bagels from What Smells So Good? Quinoa and Green Bean Salad with Tibetan Dressing from Healthy. Delicious. Madam Wong sounds like a gem! As are your irresistible pizza rolls!! Thank you, Liz. She was a gem! It was a sad day when she left ISKL. Madam Wong sounds like my kind of lady. And these pizza rolls look so good, I want one right now. For breakfast. You don't have to be a kid to want these Stacy! There should be more Madam Wong's in school cafeterias! My family would LOVE these roll ups! They look perfect and great for lunches! I love this for a number of reasons; I can make ahead, I can get my pizza fix without eating copious amounts of pizza, and these look tasty! Mmmm....these look yummy! I love making "filled rolls" for lunches. Yummmm! Love these, perfect for lunch, snack, appetizer, football party. Gosh I'm already thinking about all the uses. Oh Stacy these Rolls look amazing and such a great lunch idea! !I can see my kids going crazy for these :) Loved reading about Madam Wong too.Seems like such a nice lady! Thank you, Kim! We used to eat them mid-morning with coffee so I am sure they would be wonderful for breakfast. So true, Paula! If there were more Madam Wong's, children wouldn't hate cafeteria food. Thank you, Jennifer. We thought so! Madam Wong sounds like a wonderful woman and someone with a real passion for cooking. What a lovely tribute to her and some incredible pizza rolls too. Thanks, Conni. You can fill them with anything! Jamie Oliver made a similar thing a long time ago and used roasted vegetables chopped finely, along with the tomato sauce. And you should, Erin! We really liked them! Madam Wong sounds amazing. What a great roll idea. I'm totally making these, they look fantastic! She was a sweetheart. You could tell she really enjoyed the children and cooking for them. Thank you, Soni! It was a sad day when she left the school, Renee. Even though our children had moved on from the elementary campus, the other moms and I used to go back to visit Madam Wong. She did have a passion for cooking food that the children liked to eat, as well as their parents. Thank you, Shannon. Wish I could take credit for the idea. :) I hope you enjoy them as much as we did! Great, great story behind these scrumptious looking rolls. You lead such an adventurous life!! Where are all the places you have lived? My goodness these look fabulous and I hope to make them! I don't know how you get that dough to look so beautiful all the time Stacy! Madame Wong sounds like a wonderful grandmother type person! Thank you for traveling along with me, Laura. When I started writing this blog, I had no idea of the wonderful people I would get to know through this public forum. I am always honored, even when folks don't comment, to know that they are stopping by to visit. Some days I look at my reader stats just to marvel at the connections. Thank you so much for your kind, generous words. Thanks, Sarah! They were so awesome! She was a sweetheart, Kim. And a very good cook and baker. One of her special dishes was Cantonese soupy noodles and she'd make it for me, even when it wasn't on the menu, because she knew it was my favorite. Special lady! I love the process of making bread, Kelli. When it transforms before my eyes from a lump of unappetizing dough (although my daughters would disagree with me there because they like to eat it raw) to a risen, golden loaf, I am transported to a happy place of warm yeasty smells and melted butter. Madam Wong is indeed a grandmother - and I am sure she is the best kind! These are fantastic! And what a beautiful story about Madame Wong. She sounds like they kind of person you would hope is serving lunch at every school. I love how your posts always transport me to whatever time and place you're writing about, Stacy. Madam Wong sounds like an incredible woman who truly loved what she was doing. If only people like her were in every school, feeding the next generation. These pizza rolls look beyond delicious. I can easily see the Husband and I devouring the entire pan in one sitting! I have made all kinds of cinnamon rolls - but never thought to do pizza!! Love these! If only every lunch lady cared as much, children would be much happier at school, Sarah! I am sure of it. Thank you, Nancy! As far as I know, Madam Wong cooked everything fresh from scratch, unlike the canned and frozen horrors I've heard of in the US and UK schools, and possibly in Canada as well. As for the rolls, they go down pretty easy! They are great, Camille! Do give them a try! You made me laugh with the tape measure. I have a similar recipe but I don't use yeast so no rising time required - I'm afraid I'm just not patient enough. Yeah, I take those photos mostly for me for when I am writing up the post but I thought someone might enjoy them. You are the only person who mentioned it though, Nancy. :) Thanks for that! The soft yeast bread is soooo worth the wait here. Really! Pick an afternoon when you just want to sit around and read and eat bonbons and then you can feel virtuous about doing it. I LOVE THIS!!! Perfect for the lunch box and pizza is hard to resist. I'm definitely adding this to my kids' weekly menu. Thank you and a big thanks to Madam Wong! Thank you, Amy! I hope your children enjoy them as much as we do. I have leftover spaghetti sauce from making lasagna and this is what is up for tonight. Thank you for the great idea. Great idea for leftover sauce! Hope your rolls turned out lovely, Cynthia! Thanks for coming by and letting me know.